Hammer Enamour! 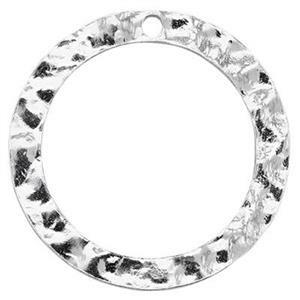 What’s not to love about our S10012 – Bright, Cast, Sterling Silver 18mm Hammered Circle! This has a .7mm hole which will accommodate a 22 Gauge or Thinner Jump Ring. Create some visual interest by dangling another circle for a mobile effect – or another bead or gemstone. Choose from our many Sterling Silver Earring Findings to finish your Jewelry Design!